Public pension systems across the country are stretched to the limit, paralyzing state economies. Yet, future pensioners and their advocates seem hell-bent to cling to their sinking ships. The reason for this seems simple: pensioners want to believe that state laws give them control over their future. And, like sailors on a sinking ship, the higher the waves rise, the tighter they hold on. Some state pension systems have converted to defined contribution plans, while others have seen legal challenges to pension levels and rights previously guaranteed in state constitutions—all in response to the undeniable economic realities. Still, there are hold-outs, who despite those realities, double-down on legal and political institutions over which they have no real control. 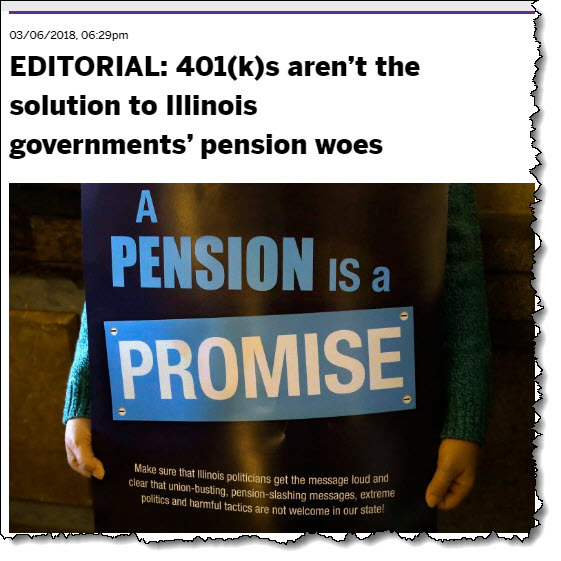 In a recent editorial, “401(k)s Aren’t The Solution To Illinois Government’s Pension Woes,” the Chicago Sun Times warned readers not to believe gubernatorial candidates that a shift to 401(k) accounts for retirees would solve the current pension crisis in the state. Specifically, the Sun Times editors warn that moving to 401(k)s would sacrifice the “control” large pension funds have over fund managers, and that without FDIC regulation, pensioners could potentially “lose all their money” in a market downturn. Even if pension boards could influence mutual fund managers or their bosses (the state of Illinois’ entire pension system makes up less than 1 percent of Fidelity’s mutual funds under management), no single investor has a prayer of controlling institutional movers. Once an employee becomes part of the pension system, their retirement is basically in the hands of others, no matter if they live in Illinois, a state going bankrupt in overdue pension obligations, or in neighboring Wisconsin, whose pension system is close to fully funded, but whose benefits may not compare. According to a Bloomberg report last year, situations in New Jersey, Kentucky, Colorado, Connecticut and about 40 other states are comparable. Indeed, the very fact that the Sun-Times editorial board considers it necessary to advocate for maintaining their state’s present system seems to admit that the system is not necessarily in anyone’s control, and that condition is relatively the same in most of the nation. The lesson, as we see it, is to discover what we can control to achieve a secure retirement. Employees with state pensions may have a “guarantee,” but the truth is that those who must ultimately make good on that guarantee are not in control of legislative, political or macro-economic forces that will be in play when the pensioner become eligible to collect. Compass Investors’ Retirement Outlook Calculator (“Your Compass”) can demonstrate the impact of each of these factors on any employee’s retirement future, but two factors differentiate this model from any pension system right away. First, while state legislators or unions may borrow from funds that should be used to shore up pension systems, exacerbating their shortfalls, individuals have control over the amount and frequency of their contributions to their retirement plan. Second, while pension systems are limited by legal regulations in the kinds of investments they can make, most importantly in bull markets, individuals are more free to take advantage of market run-ups, or free to go to cash when necessary, to grow and preserve their savings. So take control: if you’ve got a new job working for state a government with the option to go self-managed, find out how well that system is funded. If it’s in the red, get some help, and jump that ship before it’s too late. If you’ve got an IRA or a 401(k), don’t “set it and forget it.” Find professional advice that will help you keep your money moving with the market, taking advantage of those slow moving ships of state. The Sun-Times editorial actually adds a fourth area of control—the decision of when to retire—arguing that given the chance, employees seek to retire when the market booms, leaving the economy short of workers. But if most state employees do not run up against a mandatory retirement age, employees in the private sector are much more likely to be shown the door when the value of their “experience” falls in relation to salary and level of energy.